Community science refers to data collection and interpretation by not only scientists and experts but also the general public. Community scientists can help researchers maximize the amount of data collected on a project without formal training. We exist in an exciting moment for space exploration as the first crewed mission to Mars draws closer. With this excitement comes a need to create stimulating environments that can increase and/or maintain fine motor control for astronauts. What’s your solution? The second phase of the Space Robotics Challenge will focus on advancing the autonomous capabilities of dexterous mobile robots to accomplish long-term in-situ resource utilization (ISRU) tasks, with 100% autonomy. The challenge focuses on planetary surfaces, such as pre-cursor habitat deployment on Mars. Students of Space Center Houston’s Space Center University designed an experiment for astronauts to perform on the International Space Station, scheduled to launch on the SpaceX resupply mission in November. The experiment will determine if a specific, targeted enzyme can successfully sever a circular DNA strand into a linear one in the weightlessness of spaceflight. High concentrations of carbon dioxide can lead to a variety of problems in long duration spaceflight. 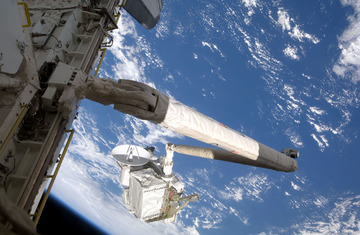 This presents a difficult issue for spaceflight as the station or vehicles are a relatively closed system, relying on filters, or scrubbers to remove carbon dioxide (CO2). Show us your design for a personal CO2 monitor for use in long-duration spaceflight. NASA’s R5 Valkyrie robot is leading the way in the advancement of humanoid robots with cutting-edge, human-like dexterity in order to provide support with mission operations. Programmers from around the world competed to help NASA develop Valkyrie’s abilities in phase one of the Space Robotics Challenge. Space exploration has moved from lifting satellites into orbit and placing men on the moon to sending probes to the edges of our solar system and the eventuality of manned missions to Mars. The only reason these advances have been possible is because of the incredible new technologies dreamed up by dedicated scientists, technicians and engineers. Have an idea for genetics research in Microgravity that could benefit humanity? Then Boeing has the challenge for you! Applications due by April 25, 2019. The Wearable Equipment for Averting Radiation (WEAR) Challenge, a NASA student design challenge for wearable radiation countermeasures, is a nationwide challenge for middle and high school age students. Sign up by May 10, 2019. NASA’s App Development Challenge provides an opportunity for middle and/or high school students to demonstrate the practice of coding and app development. In this challenge, students work in teams to develop an app that visualizes three minutes of simulated test data in support of the upcoming Ascent Abort-2 launch scheduled for June 2019. Your gateway to several open NASA challenges! Participate in NASA’s largest international Hackathon. Registration will open soon.